NYT: "Alarmed at the chance that the Republican party might pick Rudolph Giuliani as its presidential nominee despite his support for abortion rights, a coalition of influential Christian conservatives is threatening to back a third-party candidate in an attempt to stop him." [T]he two political parties have largely converged on distinct diagnoses of what the system's problems are and what reform would look like. ...The Republican plans make you pay more for your healthcare so you'll buy less. They do this by weakening the protection that insurance offers from health expenses. The Democratic plans bring everyone into the system, then use that leverage to reform the insurers and extract savings through efficiencies of scale. ...The Republican plans make it easier to choose to forgo health coverage or to buy less of it. The Democratic plans make it easier to buy comprehensive health insurance. And the voters will have to choose between the two. My newspaper column looks at the housing bubble and the environment that enabled it. ...the hucksters are still on TV. The Fed has already lowered the price of money, again, to help wash away their mistakes. The bankers and fund-managers [...] will be back soon enough with another hot product, feeling no more need for transparency than they did this time. Hard as it may be to picture just now, many of the elements seem to be in place for the next bubble. Read the whole thing after the jump. Related: Lorraine Ahearn in this morning's N&R on renters evicted when the company behind their subdivision went belly up. "There's nobody to call to get my security deposit back," said Salinda Lash..."I've got to find a new place, and I'm left with nothing." A sad anniversary at the Holder household. Looking for a video camera with Elijah. First we try the Wendover Circuit City. Nobody speaks to us as we enter. We hang out in the camera area for probably ten minutes, looking at cameras, then looking bored. It's busy in the store, but nobody even stops for a moment to say they are aware we exist. We leave. Nobody notices. On to Best Buy. We are greeted at the door. The store is even busier than CC, but a sales guy is with us almost at once. He is helpful and knowledgeable. We buy a camera and accessories. Huckabee: Bush blew it with the Axis of Evil Speech, didn't send enough troops to Iraq, gave Rumsfeld too much latitude, and turned his back on diplomacy. Also, we're in trouble in Afghanistan. Oh, and the draw-down of the surge was foreordained by constraints on manpower. It would have been more refreshing if he'd said it before the duck was quite so lame, but better late than never. John McCain: "I would probably have to say yes, that the Constitution established the United States of America as a Christian nation." Oooh, sorry. The correct answer is "No." But really, how important is it that presidential candidates know that kind of stuff? Jill Foster is videoblogging about household economics. You, too, can register. Just click here. Three weeks away, it is. The headline makes it sound like all six died at once. It's actually the US total for the year, which is still pretty damn scary but not as scary as AP plays it. Wired says it's not time to panic, yet. UPDATE: Saturday 9/29, N&R print edition goes with misleading scary headline on it's version of the story. O-dub is not buying the Edwards spin on public financing. Steve Jobs vs iPhone hackers: "Apple might as well be fighting gravity." More: "Apple essentially has two choices. Either it exposes most of the iPhone’s capabilities to developers. Or it will have to gird for an ever escalating war in which it will have to send ever more electronic brick-bombs to its best customers who don’t follow its strict rules." Tim Wu: Was muni wifi a bad idea? "Not quite. The basic idea of offering Internet access as a public service is sound. The problem is that cities haven't thought of the Internet as a form of public infrastructure that—like subway lines, sewers, or roads—must be paid for. Instead, cities have labored under the illusion that, somehow, everything could be built easily and for free by private parties." Readers just don't come to a newspaper's website looking for a messy passel of blogs. They come looking for sports, or fashion, no matter what "form" it's in. Old newspaper editors may think blogs are some crazy different variety of publication; readers don't. Beaucoup de Blackwater from McClatchy. As far as I can tell, America has never fought a war in which mercenaries made up a large part of the armed force. But in Iraq, they are so central to the effort that, as Peter W. Singer of the Brookings Institution points out in a new report, "the private military industry has suffered more losses in Iraq than the rest of the coalition of allied nations combined." ...Mr. Singer argues that reliance on private military contractors has let the administration avoid making hard political choices, such as admitting that it didn’t send enough troops in the first place...it's also worth noting that the Bush administration has tried to privatize every aspect of the U.S. government it can, using taxpayers' money to give lucrative contracts to its friends. Ms. Paynter and Mr. Brown, devout Baptists both, stand at opposite ends of a debate over the environment that has been roiling America's potent but often fractious community of evangelicals. Christians have been arguing about coal in Texas, oil drilling in Alaska and hurricanes in the Gulf of Mexico. The most charged issue of all is climate change, a focus of world attention this week with conferences at the United Nations and in Washington, D.C. America's Christians are divided on basic questions: How serious is it, what causes it, and what should mankind do about it? All sides cite the Bible...Behind the theological disputation, however, is a struggle grounded in the here and now. Who speaks for American evangelicals, and on what issues? Evangelicals in the U.S. share a cluster of core principles: belief in the authority of the Bible, a determination to spread the faith and a commitment to salvation through Jesus. But defining the group beyond that is difficult. They also have a long history of quarrels over their agenda and tension over leadership, particularly since the rise in the 1970s of the formidable political force known as the "religious right." Lisa Scheer took these photos quite recently in GSO. 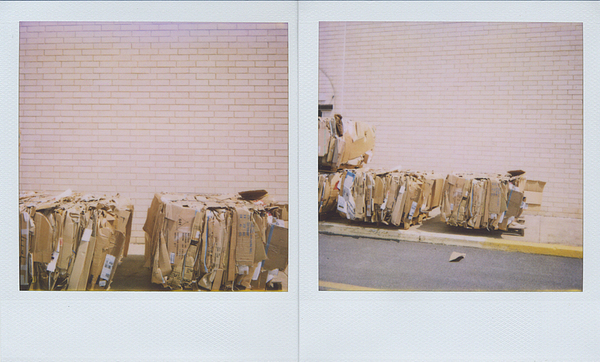 I love the fact that this is both a diptych and Polaroid. The combination emphasizes the properties of the excess and disposability of the subject matter. This document of the everyday and the mundane shows us a sculpture in its very temporary exhibition space, with you as perhaps the only visitor to that particular show, and here, the catalog. By isolating the cardboard forms against the nearly monochrome Color-Field background (no interruptions with the sky here, for example) the feeling of an exhibition space is further reinforced. The dialogue between the two images presents us with differences in distance, allowing us to approach and retreat, and in that manner get a sense of scale that relates the individual cardboard parts to the whole made by the aggregate...I first thought of Robert Rauschenberg's Cardboard pieces. AP: "Cell phones and the Internet are playing a crucial role in telling the world about Myanmar's pro-democracy protests, with video footage sometimes transmitted one frame at a time." Broder: "The spectacle Tuesday of 151 House Republicans voting in lock step with the White House against expansion of the State Children's Health Insurance Program (SCHIP) was one of the more remarkable sights of the year. Rarely do you see so many politicians putting their careers in jeopardy." Reihan Salam on Facebook etiquette. More here. Most of my FB friends are people I know through work and the web. I don't really see the point of having strangers as friends, and as noted before, most of my aging cohort of real-friend friends aren't on Facebook. BlogHer is coming to town. Greensboro really does have a promising tech-oriented creative culture. It just doesn't have that much to do with the downtown groups that talk about such things. Hold a community Tech Expo that showcases local technological accomplishments. Create a talent resource center where individuals can share knowledge, network about jobs, and have access to local companies. Yes. Yes, indeed! If only there was some kind of confab and web-savvy community upon which to build. MMB says she's looking at the letter (scroll down, then click to enlarge) from attorney Walt Jones that is portrayed by some as a smoking gun in the Wray Fray. Jones says City attorney Linda Miles had her own agenda in the case, although it is not clear from the letter that such an agenda would necessarily undermine the City's arguments against the former GPD chief. But if the Jones letter is to be considered an unimpeachable source on the matter, it's hard to see how this part helps Wray: "I passed along to the city concrete evidence that internal affairs reports were being changed and the original's (sic) destroyed...that general subject matter played a prominent part in the demise of Chief Wray." And this one: "I gave [Miles] names of people to contact and used my experience as a federal practioner to explain the obvious flaws in Chief Wray's assertions that there was an ongoing federal investigation." Or this one: "Officer Fulmore's 'claims' were patently clear...well before Risk Management Associates was ever heard." D3 candidate Joe Wilson told me on the phone this morning that the two biggest problems facing Greensboro involve low numbers: days of water left, and cops on the street. He's got some issues with Jordan Green's numbers, too. First Jordan says Joe's campaign funds (excluding a loan he made to himself) have been "raised primarily from real estate and development interests." But later in the same article, Jordan says, "a third of Wilson's campaign funds...lead back to individuals involved in real estate and development." Joe says the second one is correct. McClatchy reads Greenspan. "He acknowledges that global economic forces, more than Federal Reserve policy, kept inflation low and manageable for two decades...he means free trade, the rise of emerging, cheap-labor economies led by China and India and the benefits from information technology and the Internet...these forces — 'globalization,' in shorthand — are weakening as they mature. He fears that could mean a gradual return to persistent 1970s-style inflation over the next 20 years or so." Wait, you mean there's more to the Wal-Mart economy than everyday low prices? The labor agreement reached by General Motors Corp. is the most striking example of a bigger trend sweeping U.S. health-care: employers renouncing their decades-old role as chief health-care buyer. The auto maker's iconic status in American industry, and the example it sets as one of the biggest U.S. employers, is likely to speed this shift -- and drive discussion in the presidential campaign about overhauling the health system. Polls find health care is the top domestic issue for voters, as more Americans are on the hook for getting their own coverage. Been saying it for years: health-care reform may be a favorite liberal cause, but big companies will play a critical role in making it happen. Marc Cooper: "The John Edwards campaign suffered a major reversal last night." Hagan and Martin, Hagan or Martin, somebody wake me up if anything actually happens, OK? Smarty Jones is registered for ConvergeSouth. You, too, can register. Click here. Free and open to the public and suddenly not that far in the future. Liz Seymour: "I set up the collective house five years ago in what had been my nuclear family home...I’d love to create a place on the internet for people to come with questions and answers about collective living. Please don’t be shy about joining in the conversation." All of us will live in a variety of situations over the course of one lifetime: in a nuclear family, in a dormitory, with a romantic partner, by ourselves, maybe in a nursing home, a group home, or a prison. All of those living situations, desirable or not, are in the mainstream. Why is collective living so far off the mental map for most people? It makes all kinds of economic sense, it provides companionship and practical help, and—of increasing importance in the way the world is going right now—it is an ecologically responsible way to live. Previously, with some interesting comments, as well as some hostile and disrespectful ones. Small Wars Journal on private security contractors and the way to deal with them (via Abu Muqawama, via Instapundit). We were talking at the breakfast table about Ahmadinejad. I tried to give my kids a little context, not to downplay the awfulness of his rhetoric or the dangers of the situation at hand, but to explain how we got where we are today. We talked about our history with Iran, starting with the hostage crisis and our subsequent backing of Saddam Hussein, and going back to our role in overthrowing Mossadeq and installing the Shah. It really is a bit more complex than "they hate our freedom." From the point of view of a proud and ancient culture, a century or two of Western dominance may look like a relatively brief aberration. I thought of Chou En-lai's famous remark to Henry Kissinger when the American asked him for his thoughts on the French Revolution: "Too soon to tell." Sometimes I think this interactivity thing might just work out: N&R commenters calmly work over a pair of lame letters to the editor. I kept waiting for a punchline in the don't-teach-Spanish missive, something to clue us in that it was a parody of know-nothingism. I thought for a moment that the part about the near-complete lack of cultural value was it. Teaching Chinese and other non-Romance languages is a good thing, though. Wall Street Journal: "The housing market is going into a deeper chill, and consumers are starting to shiver." D.R. Horton is going to auction new homes in San Diego, some starting at 50% off the original price. WFMY does a very park-friendly piece on the Haw River State Park. Some actual reporting in there, too. Nice job. County Commissioners contact info here (scroll down). CC meeting 10/18. Applied Rationality applies rationality to the emotional subject of Hannah Montana tix. Not sure his arguments, however sound from an economics POV, address the issue of a public entity selling out to private scalping companies before the sweet little daughters of taxpayers get their chance to buy. And how does North Carolina's no-scalping law come into play? Sally Greene points to a photo essay on the Paschal house in Raleigh. Preservation NC wants to save it. Anyone got $5.6 million lying around? Beautiful place, designed by James Fitzgibbon, very much in the same vein as some of Ed Loewenstein's work in GSO. Media Matters: "When American newspaper readers turn to the op-ed page of their local newspaper each day, the syndicated columnists they see there are more likely to be conservative." The liberal watch-dog group did an impressive amount of research for its report, which slices and dices the information in numerous ways. Info here on syndicated columnists in NC papers. The N&R info seems a little off. It carries Mona Charen's deeply awful column, not sure it still runs Maureen Dowd -- I quit reading her in the NYT some time ago, so maybe I'm just looking past her in the local paper. Lots of room for discussion on this topic, but the report is an interesting place to start. UPDATE: John Hood says, "[T]hey got my newspaper count wrong, my political leaning wrong, and I wasn't even supposed to be included in the survey in the first place. But other than that, a penetrating analysis." The labeling of some columnists is definitely open to question. Fec has an improved version of his local crime map. I'm excited that Elisa is coming to ConvergeSouth. Elisa is excited that Anil is coming to ConvergeSouth. I wonder who Anil is excited about? Will has mentioned to me that he's excited about the banana pudding. Erik is excited to hit 10,000 visitors at his blog, which really doesn't have anything to do with ConvergeSouth beyond the fact that he's on the sked. Jason is excited about human-powered search, which he may discuss with us next month. The GOP has all kinds of problems: "Republicans are suffering from setbacks in recruitment, retirements, money and efforts to craft an election strategy." The Dems have lots of money and some momentum in surprising places. You know what I think it all means? Not much. There's a long way to go. More Jena: every time facts seem to push us back from the easy narrative on race, there's a reminder of why that easy narrative is so persistent. Anyone know anything about telephone push-polling by an out-of-state firm being used in the GSO mayoral race? I'm hearing from people who have gotten calls that start out asking questions about the election, and then move on to questions that slam Yvonne Johnson. Who is paying for these calls? What does the Kern campaign have to say about them? I've been on airline flights that showed movies I didn't want my then-small children to see. But really, Heath, do we need federal legislation to deal with the problem? PS: "Congressman Heath Shuler will update this blog three times a week about legislation, day-to-day operations and issues of the day." You might want to take that promise off the site if you aren't going to try to honor it. Hmm. Seems like a typo made its way into this Carolina Journal article by Sam Hieb. The neighborhood, just a few blocks from Greensboro's flourishing downtown, had become an area of crime, drug-use and prostitution. Now, the majority of residential and commercial units are occupied, and a large private project financed by Milton Kern, a high-profile Greensboro developer and mayoral candidate, is springing up down the street. But Southside got its start with the help of taxpayers' money. See the typo? Somehow the word "but" got inserted at the start of that last sentence, which makes it look as if CJ is arguing that any use of tax dollars for such a vital, targeted, and ultimately successful project is a bad thing. And that would be kind of a doctrinaire-unto-the-point-of-silliness argument to make, wouldn't it? I was gobsmacked at this morning's N&R listing of the "big ideas" put forth by at-large candidates for GSO Council, which sound more like brainfarts and wee-hours dorm-room conversation than big ideas. Did they all really sound so lame, or was it better in context? The netroots are over. I read it in this morning's David Brooks column in the New York Times, so it must be true. You can go home now, the Visigoths have been defeated and Rome is safe 4evar. "Now it’s evident that if you want to understand the future of the Democratic Party you can learn almost nothing from the bloggers, billionaires and activists on the left who make up the 'netroots.'" For serious, that is a weighty load of crap. It tells us a lot more about Brooks and the Beltway mindset than it does politics now and from now on. The argument is that because Hillary Clinton's centrist campaign is doing quite well here in September 2007, the game is done. The whole subject -- "the future of the Democratic party" -- is defined by one presidential race, analyzed to the depth of about one inch. It gets worse. Brooks lazily conflates the netroots with the far left, which kind of misses a point grasped even by many conservative bloggers. He ignores the role of the web in pushing issues like health care to the fore, ignores the movement toward increased transparency across politics and governance, ignores the growing role of small donors, ignores state and local campaigns, and argues that a new movement has failed if it has gained only a seat at the table and not the whole table. It must be scary to be a David Brooks these days. In that context, reassuring bedtime stories like this one make some sense. Otherwise, not. 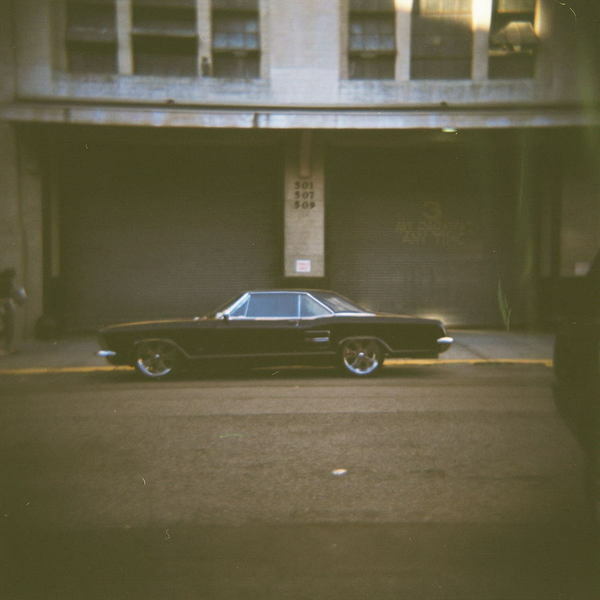 Lisa Scheer got a Holga, and made this picture with it last weekend in New York City. Elisa Camahort is coming to ConvergeSouth, for which you can register here. Yesterday's column on the conference. The NCGOP cracks me up.